Rainford Tennis Club today hosted an Open Day to raise funds for the Sam Jalloh Sports Foundation. 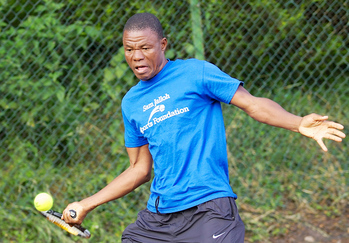 The event took place at our courts at the Jubilee Recreation Ground and raised over £250 to help support tennis programmes for underpriviledged children in Africa. Tennis players and their friends and families enjoyed an afternoon of activities, including tennis, table tennis, football, Cardio Tennis and a barbeque. "We would like to thank everyone who came down to support both our Club and the Sam Jalloh Sports Foundation." said Club Secretary, John Case. "This is such an exciting time for sport in this country, especially in the village where we live, but it is important that we remember those less fortunate and we are delighted to be able to help the Foundation's efforts in Africa."